What is a truss? A truss is a type of triangulated stiff framework made from straight struts and ties. Struts are structural components designed to resist longitudinal compression. Ties are slender structural rods, which transfer carrying tensile loads. 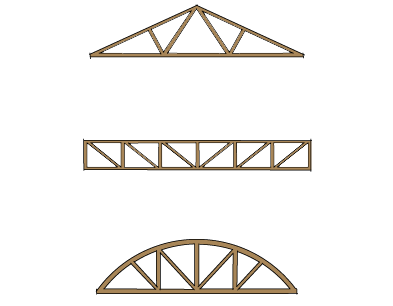 Struts and ties connect to top and bottom chords to create different kinds of trusses. 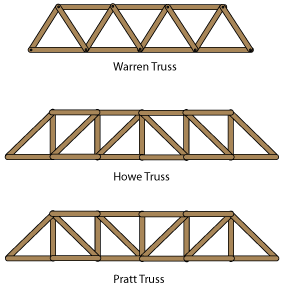 Trusses are easily seen in bridge construction. The truss was invented by the Greeks, first for ship building, then to carry the roofs of their houses. Early trusses were made of wood, then iron. Today large span trusses are built of steel and reinforced concrete. Common truss shapes are Warren, Howe and Pratt trusses which are mainly used in bridge construction. Geodesic domes and space frames are also examples of truss structures. A very large rigid frame truss without triangulation is called the Vierendeel truss, named after its inventor, Arthur Vierendeel. Leave the computer and walk around your neighborhood. Look for trusses. Look for trusses in the roofs of houses and the structures of buildings. If you cannot find any good examples in your neighborhood, research some on the web. Draw at least three trusses in your journal. Activity 3 – Build a truss and test it! Challenge yourself. Use one sheet of 3/16" thick foam core, 24’ x 36". Using only white Elmer’s glue, a matte knife and your structural design skills, build a truss that spans 30" and has a maximum of 2” bearing on each side. Cut, fold, assemble, adhere, interlock, laminate and shape the single board of foam core using the least amount of material to provide the greatest amount of capacity. Think about weight of final structural members, loading capacity resisted by members, and beauty of form. Hint: the foam will fail before the paper, and the shape of the connection at the edge of the beam is critical. The beam will transfer the load immediately to the edges of the two drafting tables. The beam will compress in the top edge and will be placed in tension in the bottom. Trusses can be made of steel, wood and stone. Trusses can span longer distances than beams.